I present to you Genron 6. The feature for this issue is “Contemporary Russian Thought I.” In combination with the next issue, we will focus on the status of thought in contemporary Russia. This is the first time that Genron has taken up a discourse in a language other than Japanese. We have asked Kyohei Norimatsu who is a specialist in Russian literature and an associate professor at Tokyo University to serve as supervising editor. It is also the first time that Genron has welcomed a supervising editor from outside of its editorial staff. I’ve always liked Russia. I fell in love with the novels of Dostoevsky and Solzhenitsyn when I was in high school, and was really into the films of Tarkovsky. When I started university, I naturally picked Russian as my second foreign language. I read Bakhtin alongside Derrida for my master’s thesis. But as someone who did not major in Russian literature and as a non-specialist in area studies, I have had very few opportunities since then to put my interest in Russia to use, and my Russian language skills have become quite rusty. Today I can no longer read or speak Russian. Our company leads a tour to Chernobyl every year, and I regret this fact every time that I go. Reading Norimatsu’s Russia, or the Specter of Opposition (Roshia aruiwa tairitsu no borei), published in December 2015, excited me and served as an impetus for me to begin thinking about this feature. I felt that this was precisely the book I was meant to read when I stopped using my Russian as a graduate student. As far as I know, Norimatsu’s book is the first overview of contemporary Russian thought written for a general readership outside of academic specialists. For those interested, I direct you to a book review that I wrote for another publication[★1]. In his book, Norimatsu clearly and concisely organizes Russian thought from the 1970s to today, using “opposition” as a key to understanding its conceptual history, and Lotman’s semiotics and its interlocutors as an axis to understanding its biographical history. As a result, it functions as a good introduction to the intellectual circumstances of Russia, and you learn that the important writers in the Russian language today are Oleg Aronson (b. 1964) and Artemy Magun (b. 1974), and Blue Sofa is the premier critical journal. Of course, this is no doubt a reflection on the author’s taste, but no introduction can be completely neutral. In any field of study, the most important thing when communicating the fruits of one’s research is to provide a bold and understandable entry point for readers who do not share any knowledge of its context. This is the first book of its kind on the topic of contemporary Russian discourse. Had this book been published twenty years ago, I would have at least continued to read some Russian texts, and would not have let my Russian get so rusty. Apart from my personal sentiments about the Russian language, providing such an entry point is precisely the “misdelivery” that I referred to in Genron 0, and is the kind of work that this magazine would like to support. And so, as soon as I read his book, I contacted Norimatsu through Yoko Ueda, a scholar of Russian drama who joined our company when we produced Chernobyl Dark Tourism Guide. Norimatsu and Ueda are the same age and have known each other for a long time. I did not know this until working on this feature, but this cohort of scholars of Russia in Japan know each other well and are good friends. They are the first generation of scholars who learned Russian after the Cold War and the collapse of the Soviet Union without the backdrop of leftist ideology. It is perhaps the fact that they had no place to go (or “pillar of support”) that in turn gave them their unique sense of solidarity. This is precisely the inverse of my own decision to let my Russian decline. They continued to stick with the Russia that I had abandoned. In any case, I met Norimatsu and told him that I would like to invite him to supervise a special feature on contemporary Russian thought. Norimatsu graciously agreed, and with his help we were able to gain the assistance of many notable scholars (who also belong to the same cohort as Norimatsu and Ueda), such as Waseda University Senior Lecturer, Naoto Yagi, who has contributed to the issue as a translator, Seigakuin University Assistant Professor, Muneaki Hatakeyama, who participated in the round table discussion, and Kanazawa University Associate Professor, Junna Hiramatsu, who will be providing several translations for the next issue. Our first meeting was in June 2016, which means that this special feature will be published after more than a year of preparation. That is the longest period that Genron has invested in preparing for an issue. The table of contents was decided through a lively discussion among the participating scholars with Norimatsu taking the lead. Most of the discussion took place via a mailing list, and the topics covered a wide range. Besides discussions on which figures to introduce, which works to translate, and what to include in the timeline, there were many intriguing posts about Russian cultural scenes unknown in Japan, as well as issues in translating Russian to katakana, such as “Warerii or Varerii (for Valery)” and “Etokinto or Etokindo (for Etkind).” (Another thing I learned in working on this issue is that there is no consensus among Japanese scholars over the method of transcribing Russian to katakana). If there was space, I would even like to print some of those posts in the magazine. In this sense, though Norimatsu is the sole supervising editor, we can say that the editors were in fact everyone who participated in the mailing list. I would like to take this opportunity to express my gratitude. Editing this issue was a tremendous learning experience for me. 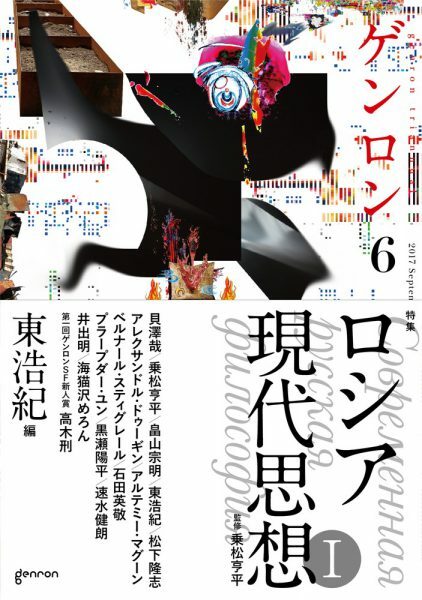 As supervising editor, Norimatsu has provided a commentary that examines in detail the aim of this special feature, the state of thought in contemporary Russia, and what it means to read Russian contemporary thought in Japan today. I also discuss my own aims in the round table discussion printed at the beginning of this volume, so I will avoid rehashing these topics here. Through these two issues, I hope you enjoy exploring a different, alternative contemporary thought that is largely unknown in Japan. However, as publisher of the Genron series, there are two concerns that I would like readers to keep in mind, and so I will briefly address them here, as pedantic as it might appear. The first is that this special feature is created from the perspective of, to borrow the language of Genron 0, a “tourist,” looking at Russia entirely from the outside. As I mentioned earlier, the aim of the present issue is to offer an easily understandable, if haphazard, entry point for readers unfamiliar with the context of Russian thought. In order to accomplish this, we have at times purposefully ignored the way that Russian writers define themselves. For example, we have purposefully placed translations of texts by Aleksandr Dugin of the so-called extreme right and the leftist Magun alongside one another. As mentioned in both Norimatsu’s essay and in the translator’s notes, Magun strongly protested this editorial decision when we were negotiating permission to publish this translation. This is because his writings share neither the forums for circulation nor readership with Dugin’s writings, and thus are not pieces to be read together. Norimatsu explained that from the perspective of Magun, this editorial decision is tantamount to placing Naoki Hyakuta and Koichiro Kokubun on the same plane. This is a helpful comparison. Kokubun would no doubt be alarmed by an anthology that placed Naoki Hyakuta and himself on the same plane and would probably protest it. However, it is precisely for this reason that I wanted to place these two figures alongside one another in this magazine. Through this I hoped that readers would come to understand the polarization of discourse in Russia today. Thanks to Norimatsu’s tireless work, we were able to obtain Magun’s permission. I would like to thank them both once again for their generosity. The reason that I came to the above decision was because I am nothing but a “tourist” when it comes to Russian thought and culture, and Genron takes the editorial direction of valuing precisely this non-participatory view. In truth, someone should make an anthology on contemporary Japan that places Naoki Hyakuta and Koichiro Kokubun alongside one another. The second is that while part of the aim of the present special feature is the mission to introduce Russian contemporary thought, it isn’t necessarily limited to that aspect. Rather, I am hoping that Russian contemporary thought will serve as an entry point that invites readers to explore more universal questions. What is Russia? What is Europe? What happens when something outside of modernity (this of course includes Japan) desires modernity? The round table discussion at the beginning of the issue, particularly a comment by Hajime Kaizawa, provides us with a hint. Kaizawa is one generation older than Norimatsu and his colleagues, and is a forerunner of the work presented here, having introduced Ryklin and Etkind in his works. His paper on Bakhtin, first published in 1998 in Critical Spaces (Hihyo Kukan) and later included in his book The Torn Festival (Hikisakareta Shukusai), reinterprets Bakhtin’s theory of carnival as the reaction of his denial of psychoanalytical thought, and retains its critical edge today. It seems to me that the critical horizon of this special feature broadened and deepened with Kaizawa’s participation. There were many hints in his comments, but I was of course personally drawn to his thoughts on Bakhtin. Scholars have tended to interpret Bakhtin’s theories as being products of something Russian or Soviet, or perhaps of the individual talent of Bakhtin himself. However, Kaizawa suggests instead that Bakhtin’s aesthetic theory should be understood within contemporary philosophical trends as an attempt to overcome Husserlian phenomenology. This is a very important suggestion. Much of twentieth century philosophy began with overcoming Husserl. Heidegger is a representative figure; in fact, Bakhtin (b. 1895) and Heidegger (b. 1889) are basically of the same generation. If Bakhtin’s theoretical work is in fact structurally built with the same paradigm as Heidegger’s ontology, and this feature is merely hidden on the surface by its vocabulary, it opens up many possibilities for understanding Bakhtin. At the very least, it will open new and substantive possibilities for comparison with works that were also under the strong influence of Husserl and Heidegger, for example French thinkers like Derrida. As I noted at the beginning of this essay, twenty years ago I attempted a comparison of Derrida and Bakhtin in my master’s thesis. I tried to argue that despite his critique of parole, or phonocentrism, Derrida’s concept of writing (écriture) and Bakhtin’s concept of voice actually carry similar structural philosophical functions, but I could find no related articles on the topic back then. I could not strongly and clearly establish my very basis for comparing Bakhtin and Derrida, so my argument failed to mature in organization. This failure was one of the reasons why I abandoned the Russian language, but perhaps I can do something different today. For example, perhaps I can develop a more academic thesis arguing that Bakhtin’s face = character (litso, лицо) corresponds to Derrida’s writing within the context of critiquing phenomenology. These were the thoughts I had while listening to Kaizawa speak. Be that as it may, it is beyond the role of this preface to expand on this possibility. The special feature on Russian contemporary thought will continue into the next issue. Perhaps I will continue these lines of thought in the introductory remarks for that issue—or perhaps I won’t. The present issue is a feature on Russia, but now I would like to write a few more introductory notes about this magazine itself. There may be quite a few readers who find it strange that this magazine, which has until now focused mainly on the value of “criticism” in Japan, is now presenting a feature on a foreign discourse. I will provide my thoughts on this in some detail for such readers. My explanation below is divided into two: one simple and the other complicated. Though I did not intend this, what resulted in the latter explanation is also a long supplement, or perhaps a response, to the dialogue with Bernard Stiegler presented in this issue alongside our feature on Russia. I will start with the simple explanation. For many years in Japan, there has been an emphasis on the necessity of broadcasting information abroad. It was said that Japan only receives and does not broadcast, that there should be more broadcasting of information. True, this suggestion was valid for a time. This was because “catch up and surpass” was national policy until the end of the Showa era, and Japan was a country that continuously imported foreign culture in both the public and private sectors. Until about thirty years ago, many Japanese scholars could speak French or German, and most people followed literary and cinematic trends in Western countries. But this situation changed dramatically as we entered the twenty-first century. Manga and anime have become global cultural industries. Booksellers in Asian metropolitan centers are lined with translations of Japanese authors. The names of the Japanese creative class appear daily in foreign media. Statistically speaking, the number of foreigners learning Japanese in the quarter century between 1988 and 2012 has increased five-fold[★2]. Now Haruki Murakami is a top candidate for the Nobel Prize in Literature, Takashi Murakami is one of the most successful artists in the world, and Makoto Shinkai’s latest work has taken the Chinese market by storm. It seems as though the Japanese can broadcast information quite naturally without a conscious focus on dissemination. Japanese culture has finally become a part of world culture! Maybe we should simply celebrate this fact. However, as it is sometimes suggested, the issue lies in the fact that Japanese people’s interests in things abroad have withered in exchange for their rise in confidence in their own culture. Japanese foreign exchange students have fallen drastically since peaking in 2004[★3]. Television only broadcasts programs of Japanese people praising themselves. Pop charts are filled with Japanese idols and anime songs, and few people read novels in translation anymore. While people were worried about too much reception and too little broadcasting, it seems as though somewhere along the line Japan became a country that only broadcasts without receiving. In fact, the same problem is emerging in the world of thought and criticism. Today, a fair amount of Japanese criticism is translated into foreign languages. Two of my books are already available in English, and some works of young writers are now being translated into Chinese and Korean. For example, Ryota Fukushima and Satoshi Hamano are among authors related to this magazine who have been translated. Even if you are writing only about Japan while living in Japan with a Japanese audience in mind, before you realize it, your works are crossing borders and being read abroad. That is the condition of the global society in the twenty-first century, and in this sense, criticism, too, is being broadcast unconsciously, just like anime and light novels. Yet, the fruits of that dissemination rarely make their way back to readers and writers in Japan. In fact, I myself know very little about how my own works are being read in the United States, China, or Korea. Here too, there is only broadcasting and too little reception. In the past, Japanese philosophers and critics were conscious of the activities of contemporaries abroad. Whether it be in English, French, or German, interesting texts were translated immediately, and this ability to receive became one of the strengths of Japanese scholarship. Yet today, we know surprisingly very little about what contemporary Americans, Europeans, or Asians are thinking and writing. Lately I have felt that this situation contains a serious problem. And so, from now on, I would like this magazine to be more aggressive in being attentive to cultures and discourses outside of Japan. This means that our special feature on Russian contemporary thought over the next two issues is our first attempt at this. That was the first, simple, and short explanation. Many readers will probably be satisfied with the above. However, I know that there are some readers of this magazine, though in the minority, who will not be satisfied with this. This is because I am the author of Otaku: Japan’s Database Animals (Minnesota, 2009), known for its analysis of otaku culture. Furthermore, the Zero Generation criticism that I once supported was a discourse only interested in domestic social phenomena and internet culture, and went so far as to say that this attitude was critical. Over the past decade or so, there was a period in which people said that true criticism should focus only on Japan and should eliminate formalistic importation of thought from abroad, so that we can refine our understanding of the political and cultural contexts of Japan as much as possible. I myself would have been first to claim such a position. As such, my readers today who became acquainted with me during that period might feel as though these new developments in the magazine are a sort of betrayal. I need to clear up this misunderstanding. This is why a long, critical explanation is necessary. Please bear with me a little longer in these introductory comments. Though it may seem similar on the surface, my perspective here differs from the perspective which says that culture and discourse in Japan have fallen behind, or have become stagnant, and that we need to pay more attention to what is happening abroad. that some countries are ahead and some countries are behind is no longer tenable. Content and discourse are created all around the world in diverse contexts, and freely circulate, get mixed together, and are consumed flatly; those are the conditions of our times. Here the subject of circulation is the consumer, not the producer. That the consumer is now the subject of circulation means that we must now view as a choice the decision to continue to choose and consume content that belongs to a particular context or genre. The postmodern doesn’t necessarily just give birth to remixes and sampling. It also produces otaku and geeks. When that happens, it is possible that those otaku and geeks are even more global. It is within this global postmodern world where shut-in otaku can paradoxically open up and connect with other shut-ins from around the world precisely because they are shut-ins. This paradox is in fact what is happening with the so-called Cool Japan. Today, the idea of equating being open with awareness of foreign works and being closed with only knowing Japanese works is simply nonsense. to seek content from abroad. This is a conclusion I draw on principle, but we can especially say this about Japan. There is an extraordinarily rich accumulation of traditional culture and pop culture in Japan. One can receive plenty of intellectual stimulation from simply reading Japanese novels, watching Japanese anime, and visiting Japanese websites. We can say the same thing about criticism. The history of criticism in postwar Japan is both sophisticated and complicated, and is in no way inferior to the academism of Europe and the United States. It is due to my belief in this fact that I devoted the features of the first year of Genron to a retrospective on postwar Japanese criticism. So what is the issue? If this is my belief, why do I have to go out of my way to incorporate the words of foreign people from foreign countries into Genron? of Genron 0, we must understand that “parents” and “children” have different missions. In this postmodern global age, we cannot criticize consumers for enclosing themselves into small, particular contexts. That is our ethical standard today. That is why I support the otaku world. I have no choice but to support it. But that support is separate from a judgment upon the nature of its productivity. Otaku, or rather all consumers, seek repetition. That is almost the definition of the otaku or the consumer in general (this is what Stiegler is likely arguing in his lecture published in this volume). Otaku want the same thing to be continually produced and provided. This characteristic is compatible with the expansion in scale of the market, and thus is economically beneficial for a given period. Cool Japan and postwar Japanese criticism both likely experienced such a period of expansion. But there is a limit to this expansion. And when that limit arrives, otaku repetition offers no solution. This problem remains no matter how much one affirms the otaku world. I am a consumer when it comes to most commodities, but when it comes to criticism, I stand in the position of producer, not consumer. From that position, I am beginning to sense the limits. For the last several years, I have felt that I can no longer write anything new or plan a stimulating project by hoisting only the history of Japanese criticism on my back, piecing together only the expressions of Japanese writers, and engaging only Japanese readers. Though readers of Genron 4 might be caught off guard by this, the “Criticism of Contemporary Japan” project was also built under the weight of this struggle. On the other hand, as I witnessed a range of aimless works by scholars of my generation, I also began to wonder whether this was not simply a worry that I alone harbored, but a discomfort that is shared among critical writers of my generation or younger more generally. To put it simply, I began to wonder whether Japanese writers younger than a certain generation have fallen into an autotoxication. I wanted to liberate Genron from this toxicity. The reintroduction of foreign contexts is one method for doing this. This means that from now on Genron will seek to become a critical magazine for producers/parents, rather than consumers/children. Children only seek the same thing. They do not need unfamiliar words from unfamiliar countries. They only need a repetition of Takaaki Yoshimoto or Jun Eto or Kojin Karatani. To repeat, I do not criticize consumers/children for staying that way. Postmodern ethics accepts them. But producers/parents cannot stay that way. Nothing can be created through staying that way. That is why we need to introduce unfamiliar words from unfamiliar countries in a haphazard way. If there are those among you that hope to one day become a critic or a producer of any content in general, I believe you will then realize the importance of this haphazardness. Children do not need reception. Parents need reception, or insemination. We can also express this difference in the following way. We live in a global postmodern world that is supported by internet technology. The internet is a technology that only strengthens dissemination, not insemination. During the twentieth century, people still believed that the internet strengthened insemination. They believed that through the internet people around the world would read books from around the world and listen to music from around the world. But the customization of search engines shattered those dreams, and the emergence of social media spelled their final demise. People can gather an infinite amount of information on the internet. But they do not receive anything. They are never inseminated. People still only read the same things they used to read and listen to the same things they used to listen to. They just broadcast their tweets and fantasize that the whole world will pay attention to them. As such we should probably say that this tendency toward dissemination without insemination is not necessarily unique to Japan, but a general tendency of all internet users, nay, of all global citizens. Works and discourses become mixed in the postmodern. Everything is circulated and consumed flatly across borders. But if such is the case, isn’t it also the case that only those who can cleverly use this mix, in other words, those who can gather as much information as possible and tie together all sorts of contexts into new forms are the ones who can escape this solitude of one-way dissemination that has entrapped us all? If all consumers becoming otaku, entrapped in their own filter-bubbles and the repetition of the same thing, is one of the fates of the postmodern, doesn’t it make it that much more important to guide some noise into those bubbles, or to use the words of Genron 0, to guide in misdeliveries? In this global, postmodern, and flat twenty-first century, where there is no maturity or repression and everything is engulfed by the logic of the consumer/ child, shouldn’t the new producer/parent be defined by its ability to receive and misdeliver? In a nutshell, this is what I have been thinking about lately. People say that we are now living in an era where consumers are no longer differentiated from producers. They say that all consumers can become producers. In fact, cultural consumption today is overflowing with texts, music, and videos made by consumers. But such an observation is far too superficial. Most consumer/producers can only repeat the same thing. As long as consumers are surrounded by consumer/ producers, we cannot escape that infinite repetition. It is precisely that which rescues the consumer/child from this repetition that is truly worthy of being called a producer/parent. If the role of intellectuals in the twentieth century was dissemination and enlightenment, their role in the twenty-first century will be reception and misdelivery. This is why I’ve decided to orient the table of contents of Genron toward reception. I’ve decided to open the door to misdelivery. I’ve become bored with repeating the history of criticism. I’d like to take a break from thinking about the postwar, about criticism, about Japan. ★1　“Roshia gendai shiso toiu buruoshan (The Blue Ocean of Russian Contemporary Thought),” Hyosho 11 (Tokyo: Hyosho Bunkaron Gakkai, 2017). This joint discussion examined the major contexts and present-day circumstances regarding “Contemporary Russian Thought,” the basis for this two-volume special edition. Russian literary scholars Hajime Kaizawa and Kyohei Norimatsu, the film scholar Muneaki Hatakeyama, and Hiroki Azuma participated in this discussion. At the start of the discussion, Norimatsu posited the question of whether it would be possible to reconsider Russia—which like Japan emerged late into modernity and aimed to “overcome modernity” —in relation to the art critic Noi Sawaragi’s concept of the “bad place” (warui basho). This would allow for a reconsideration of Russia’s complex historical twists as it came to consider itself in opposition to Europe and America. Accepting this proposal, the first half of the discussion focused primarily on the what the meaning of “Russian” is. Kaizawa emphasized that following the collapse of the Soviet Union, high culture and thought connected to the left stagnated as culture became more conservative and focused around the petit-bourgeois. Moreover, he observed that the characteristics of “Russianness” emerged in conditions similar to those at the end of the 19th century, when Russian literature spread domestically in the form of pseudo-religious mass literature, as opposed to its reception in Europe as a “noble” literature that spoke to issues of the soul and God. Hatakeyama indicated the mediation of globalism between the nineteenth and twentieth centuries, as well as parallels between Russia and the United States. Comparing these characteristics with the case of Japan, where tendencies to resist globalism can be seen in the country’s excessively nativized subcultures, Azuma cast doubt over the view that “Russianness” was an idea that was fabricated artificially for the sole purpose of acting in opposition. He suggested that the concept of “Russianness” does in fact contain some substantive elements. Norimatsu pointed out that the representative model for “Russianness” discovered in the latter half of the nineteenth century by intellectuals at the time was “sobornost,” a word meaning “unity among many” that idealized a community nonexistent in Western Europe. The latter half of the discussion focused on the similarities between the concept of “sobornost” and Bakhtin’s theory of polyphony, as well as the reception of contemporary thought in Russia. According to Kaizawa, Russia at the beginning of the twentieth century had imported Husserl’s phenomenology in a unique form, and Bakhtin attempted to surpass Husserl using methods different from those of Heidegger. Kaizawa remarked that parallels could be observed in Bakhtin and Heidegger as two developments of Husserlian thought. The discussion touched on various other viewpoints that capture “Russianness.” These include the Russian “database” that prioritizes a classification transcending concrete time and history, the philosophical connection between cosmism and California ideology, and the drive towards the intertwining of the body and language. The discussion ended by considering the possibilities for oppositional thought that could be produced in present-day Russia. in World War II and Russia in the Cold War—and both Japanese and Russian postmodernities are products of defeat by America. Both of these (post) modern movements are littered with calls never to forget their original defeat, the starting point of the modernization process, and to turn defeat into victory. Based on this understanding of circumstances in contemporary Russia, Norimatsu explores the impasse of liberalism, the rise of nationalism, and the recycling of Soviet memory in the anti-authoritarian use of nationalism by New Leftist thought. his characteristic vibrant and energetic prose steeped with heavily biographical elements. He has been awarded numerous prestigious literary prizes in Russia, including the National Bestseller Award. In his “A Letter to Comrade Stalin” (2012), Prilepin provokes Russian liberal intellectuals by praising Stalin in the name of liberalism. At the same time, the essay also evokes the trauma of totalitarianism that still haunts post-Soviet Russia. Matsushita considers the significance of Prilepin’s activities in contemporary Russian society. This interview took place on May 27, 2017, as part of the program entitled “A Night of Philosophy,” organized by the Institut Français du Japon in Tokyo. Prior to the interview, Bernard Stiegler gave a lecture entitled “Finite Games, Infinite Games” (Jeux Finis, Jeux Infinis). Thislecture was discussed during the interview, moderated by Stiegler’s friend, the media information scholar Hidetaka Ishida; Hiroki Azuma participated as a panelist. In the lecture, Stiegler discussed the book Finite and Infinite Games (1986) by the scholar of religion James P. Carse. Carse argues that two types of games exist: “finite games,” which expend time within a closed set of rules with the aim of victory; and “infinite games,” which create time by changing the rules in response to player action, with the goal of continuation. Steigler stated that the contemporary media environment desires the realization of infinite games, as finite games turn users into the proletariat. of complex interfaces that would lead people to infinite games. However, Azuma indicated that in the present, where globalism and nationalism run parallel, both a humanistic will and an animalistic drive influenced by sensitive pleasure are important. This dialogue articulated a large gap between the tradition of Western philosophy, based on the primacy of humans over animals, and the tradition of Japanese thought, described by Kojève as “Japanese snobbism.” The panel ended the discussion by acknowledging this divergence and questioning how a political philosophy based around will and drive can be constructed as their next topic of focus. Japanese art history considers a “history of reception” based on “reception” of foreign cultures as an authentic method for describing the trajectory and characteristics of Japanese culture. This reception-biased sense of history positions Japan at the far reaches of the world and isolates it, giving rise to the concept of Japan as a peripheral island, or as a place at the edge of the “Three Kingdoms.” At the same time, however, this history also gives rise to a unique nationalism that attempts to invert this viewpoint, bound in the idea of Japan as a “land of the gods.” This frequently devolves into myopic glorification of Japan in the form of a masochistic view of history. In this essay, Kurose introduces a new viewpoint of “dissemination,” juxtaposed against the biased view of Japanese art history as merely a “history of reception” — that is, an art history of “receiving.” To test this history of “dissemination,” he takes up the case of three artists: Takashi Murakami, Ikuo Hirayama, and Tenshin Okakura. With his “Superflat” trilogy, Murakami succeeded in “disseminating” his art to the West, but has yet to succeed in “disseminating” to Asia. Hirayama did not leave behind works like those of Murakami, nor did he leave behind excellent work at the discursive level, but he was a painter strongly aware of the Buddhist connections to East Asia. Finally, Okakura, as a thinker of Meiji-era Japan, not only “disseminated” his theory of art to India, but was also a rare example of someone who strongly influenced Indian religious figures and artists. From the work of these three artists, Kurose clarifies the cyclical structure of “reception” and “dissemination” in Japanese art history. This story is a revised version of the work that received the “Genron SF Newcomer Award” at the first Genron Ohmori Science Fiction Writers’ Workshop, which began in 2016. The members of the selection committee were literary critic Nozomi Ohmori, SF writer Hirotaka Tobi and Hiroki Azuma, representing Genron. This is the debut work of the award recipient, Kei Takagi. At the beginning of the seventeenth century, humanity, having made contact with aliens in the previous century, discovers on the exoplanet Senekia the corpse of a strange being resembling Jesus Christ, along with a large right hand orbiting the planet. Garcia, a Dominican priest who visits the planet to conduct a survey, asserts that this phenomenon is a miracle, and to prove his hypothesis, he plans an experiment. His hypothesis is that if he uses faster-than-light correspondence based on the special gravitational waves created by the aliens, it would be possible to make contact with God, who exists beyond space. However, at the same time, this plan poses a threat to the life of his fellow passenger Catalina, a member of the second committee of the Dominicans. At the same time, the corpse of a settler with his brain completely removed is found buried on the planet. Based on a survey by a priest at the site named Mateo, the priests conclude that the planet itself is a living creature with a large brain. The large right hand and the creature resembling Jesus are all embodiments of images depicted by the planet’s brain, and the priests debate over whether or not God is the cause. At the conclusion of the debate, the experiment is conducted, and both Garcia and Mateo’s theories are proved correct. They establish that based on distortion at the site of gravity, an extremely small black hole is created, and the images thought of and depicted by the planet Senekia are transmitted as information to a realm beyond space; when it returns to space, it manifests as a large hand in a satellite orbit. However, the images that the planet Senekia draws are images received from those who die on the planet itself, so Senekia attempts to bring about its own death by making the large hand fall on the planet surface. When catastrophe seems imminent, Garcia avoids disaster by transmitting an image through his own brain and overwriting the image held by the planet. Due to this action, Garcia becomes one with the planet. Garcia, under a sky full of stars, gazes on as the priests’ spaceship departs. The student movement in Japan faded from public consciousness around the year 1970. Part of its passion for revolution migrated from urban centers to the countryside, creating a trajectory towards social reform through agriculture. In modern Japan, there have been many attempts to link the notion of an ideal society to agriculture and nature. The utopian “New Village” that novelist Saneatsu Mushanokoji founded in 1918 is one such “agricultural commune.” In fact, “agricultural communes” are closely tied to literature. Mushanokoji died in 1976, but the “New Village” began its own decline later, starting from 1983. This time period also coincided with agricultural recession and the increasing urbanization of Japan. The aging of rural populations was accelerated by youth moving to cities and away from their hometowns, where jobs were limited to agriculture. Natsuo Kirino’s Politikon (2011) is a novel that most directly depicts such an image of the “agricultural commune.” The population of Iwan Village, an old utopian village, ages and diminishes in the late 1990s. Seventy years into its founding, the village can no longer maintain what was envisioned as its most important ideal – self-sustainability – thus signaling its end. The afterlife of Mushanokoji’s “New Village” utopia is cruelly depicted in Politikon, a vivid projection of our contemporary issues. Now in 2029, in post-earthquake Japan, people can predict everything about the future by using a mysterious quantum computer, as they inhabit a phantasmal society created by augmented reality. In the city of Tokimeguri, a special reconstruction zone in the Tohoku area, strange dealings and life-or-death fights take place among the mysterious and wealthy Tokihori family, who show an unusually strong interest in time; the police; and an artificial intelligence that moves in the shadows, each for their own reasons. On the night of the summer festival, our protagonist Torihiko Shiratori meets Yuyuka, the daughter of the Tokihori family. The meeting causes him to be dragged into this conflict. At last, the final part of this story approaches the heart of the mystery surrounding distorted time. In the Tokimeguri police department’s underground parking lot, Superintendent Shogo Kiritani now confronts a mysterious masked man who has come to steal the corpse of Ikuno Shinomiya, a detective killed in the line of duty while investigating the Dischronia Syndrome incident. The man, who claims to be an employee of the cryonics corporation Cryoracle, states that Ikuno’s soul has already been “backed up,” and that she can be resurrected from her body whether it goes to the police department’s Special Technology Research Division or to Cryoracle. Meanwhile, Torihiko picks up the right hand of Ikuno’s corpse from the rubble at the explosion site in Tokimeguri-Akiba and then notices that the hand has not decayed despite two days having passed. Not only that, the hand begins to move on its own and escapes from a window, giving Torihiko a glimpse of Ikuno and the police’s secret. Torihiko seeks out the Tokihori family estate, hidden somewhere in space-time, to explain the mystery of distorted time and to execute his plan of slaughtering Yuyuka at the Tokimeguri-sai festival. A week later, he receives a message from Detective Haori Kiryu stating that the location of the manor has been pinned down, but who could have predicted where it would be.